Ever since I made a pot of split pea soup in December, I’ve been playing with interesting ways to use organic split peas. The soup was delicious, much better than my memory of the few times I tried making it years ago, and cooked up in less than two hours in my VitaClay without pre-soaking. I filled it with potatoes, ham, leeks and thyme, and savored the leftovers with Theo’s assistance for the better part of a week. After that, I tried grinding some of the peas to fine powder with my dedicated spice and seed grinder. It stayed a tiny bit gritty and maintained a minty green color, but I was able to hide small amounts of it successfully in Nolan’s favorite flatbread and cracker recipes. Dried peas are an excellent source of soluble fiber, a decent source of vegetable protein and resistant starch, and are very rich in molybdenum, which is useful in fighting candida overgrowth–all very good reasons to keep looking for ways to incorporate them into Nolan’s diet. I still have some green pea powder to play with, but have put it on the back burner after purchasing a bag of organic yellow split peas. The nice thing about the yellow split peas for my purposes is that they are yellow, which is a much less obtrusive color than green when you are trying to feed a picky eater like Nolan. I soaked a cup and a half of the yellow peas in filtered water overnight, and ended up making a whole day’s worth of meals incorporating them. I threw most of the soaked peas on the stovetop in fresh water and let them simmer for about an hour until they were tender, then drained and pureed them in the blender with splashes of fresh water until I ended up with a smooth, thick puree along the texture of well-mashed potatoes. 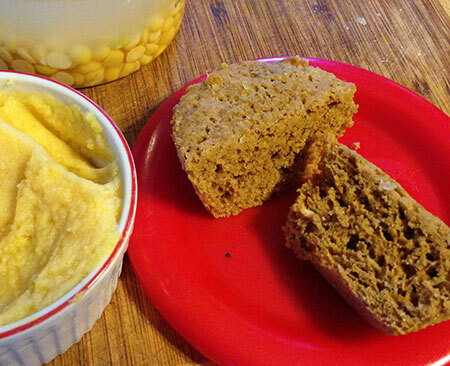 This puree then made its way into a variety of recipes. First up, breakfast. Nolan is still on a muffin kick, so I have been making different flavors of grain-free muffins every single day. I’ve used both garbanzo bean flour and adzuki bean paste successfully in baking before, so I thought the pea puree was worth trying here. To cover up their native flavor, I combined the peas with home-canned applesauce, molasses, maple syrup, cinnamon and ginger for an apple spice muffin lookalike. The batch came out nicely both in the steamer and the microwave, and as hoped, looked and tasted more of the flavorings I chose than they did of peas. Unfortunately, I made the mistake of failing to include chocolate chips, so while Jeremy and Theo approved, Nolan rejected them. Next up, lunch. I used a majority of the pea puree here, making myself some split pea soup. This was a velvety version of the rustic green VitaClay soup, omitting potatoes for the sake of speed. Nolan was never going to eat soup, but I now know this could make a nice cheese sauce for pasta, either using his favorite white cheddar or the equally beloved nutritional yeast. If his interest in pasta ever resurfaces, I will give it a shot. Macaroni and peas, anyone? Finally, dinner. The peas were more of an accent here than the main course. 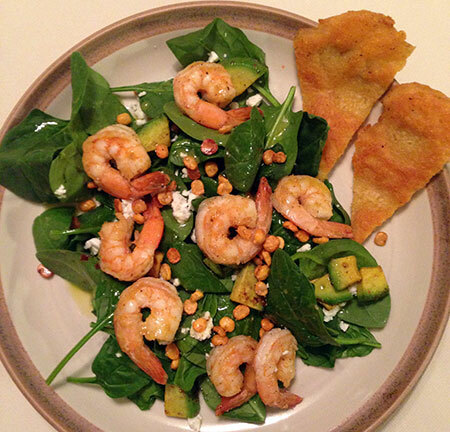 The meal was sautéed shrimp on a spinach salad with feta, avocado and basic lemon vinaigrette. While the shrimp were thawing, I used my remaining soaked but uncooked peas to make a crispy garnish for the salad based on this recipe. I roasted my peas in the cast iron skillet with bacon grease and tossed them with salt, garlic powder, and smoked paprika; I then used the same seasoning blend on the shrimp and threw them in the same hot skillet. Theo and I snacked on some of the crispy peas while I finished making dinner, and they were great, with a flavor that reminded me more of corn nuts than of peas. They added a nice little crunch to the salad. To make dinner a bit more substantial, I used the last half-cup of split pea puree to make a nut-free, egg-free pea flatbread. This took moments to stir together, and cooked up quickly too. I adapted and scaled the batter from this recipe which calls for a larger amount of yellow split pea flour, and ended up with a crisp flatbread the size of a salad plate that we all happily shared. Jeremy commented several times on how well he liked the bread, and thought it would make good pizza crust. Nolan was a bit more skeptical, but ended up eating several slices as well. This is a tester-sized batch that makes four 1/4-C muffins. You can triple the recipe for a standard dozen. So far I have only tested these in the microwave and bamboo steamer, and will update the recipe for oven baking next time I make pea puree. Mix together all ingredients in a small bowl. Dish by 1/4 C into four silicone muffin cups. Microwave: In my microwave, a single muffin cooked perfectly in 60 seconds. You might need a bit of extra time doing all four at once, or further adjust based on your microwave’s power levels. Steam: These were cooked through in my bamboo steamer after 12 minutes. I live just over 6000ft elevation in Colorado Springs, where the boiling point of water is about 200F. If you live at a different elevation, you may need to adjust the cooking time up or down based on boiling points. Stir together all ingredients to form a thick but spreadable batter. Heat a cast iron skillet over medium high, lightly greased with coconut oil or bacon grease. When skillet is hot enough to start smoking, pour in batter and quickly spread with the back of a spoon, using a light touch. (It will probably not be perfectly even, but that is okay.) Cook until the bottom is deeply golden brown, then use a large spatula (and tongs if necessary) to flip. Cover and continue to cook for several minutes until the other side is golden brown and the middle is set. Source: Adapted from Cottage Life on Pilgrim’s Farm.